Thea Landen: The Fall of the Midnight Scorpions - Available Now! 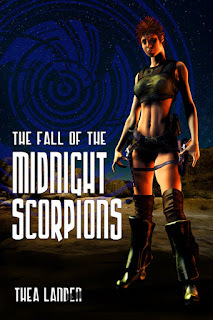 The Fall of the Midnight Scorpions - Available Now! It's here! 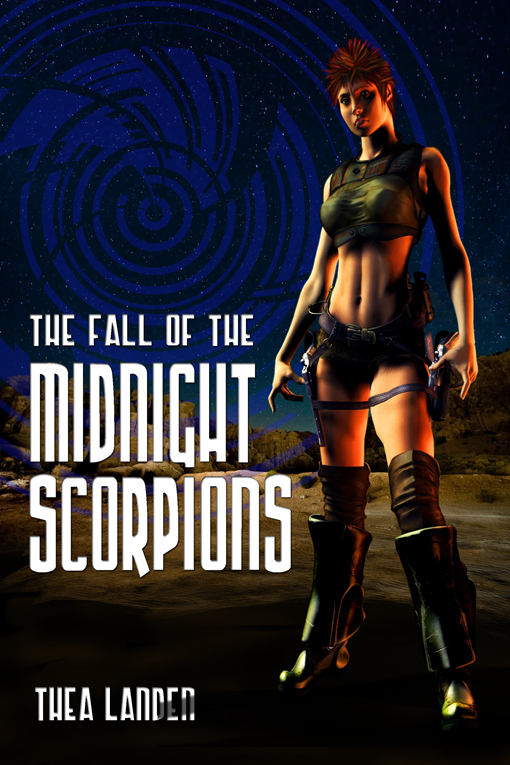 The Fall of the Midnight Scorpions has been released! I have some fun promotional events coming up in the next few weeks, so be sure to watch this space. In the meantime, have a blurb and a nice, long excerpt! Ro turned around and bent over the map again. Using her previous markings as a guideline, she labeled another potential point of entry to the hidden lair. Before she could measure the distance to the next area she wanted to denote, the door opened again. “Forget something?” she asked without looking over her shoulder. His breath tickled her skin. “There were quite a few ways in and out of the base. Elevators, ramps…different areas were used for different purposes,” she said, keeping her voice even and casual. “And we don’t want that.” The low tones of his voice hummed through her. Slowly, Ro turned around. Reggie didn’t release her from his grip, nor did he do anything to untangle their legs and put some space between them. Propping herself up on one hand, she tilted her head back to stare up at him. She’d admitted some attraction to him in her solitary moments, but had sworn not to act on it. Now that one strong arm was curled around her and she stood face-to-face with his alluring smile, she didn’t know whether to give in to her impulses or push him away. She looked down at where she had planted her sweaty palm right over one of her larger markings. “Damn it,” she muttered, rubbing the silvery graphite smears off the heel of her hand. He left her alone in the quiet room. Ro inhaled and exhaled, trying to quiet the pounding of her pulse in her ears and ignore the heat that had crept throughout her body. Shaking her head, she smoothed out the wrinkles in the paper in front of her before resuming her work. Happy 5th Anniversary, Decadent Publishing!